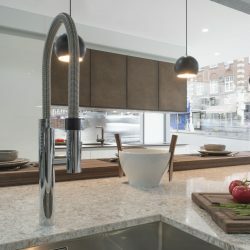 Curved Kitchens – The Way Forward? The kitchen is arguably one of the most important rooms of the house. Therefore it is vital that it feel comfortable, welcoming and fun. One way to accomplish this is to design curved kitchens. A kitchen that includes several curved elements tends to feel more fun and more open. A curved kitchen can also allow for the addition of unique elements that are not typically found in kitchens. A curved kitchen is an ideal design if your house already includes curving walls or round rooms. If you are designing the kitchen from scratch, and you are able to build curved walls or ceilings to fit the kitchen, then give it a shot! The lack of rigid shapes and harsh edges helps get rid of that boxy kitchen look and trades it in for a relaxed, modern kitchen. The lack of straight lines found in a traditionally designed kitchen creates a calming atmosphere for the room. The simple addition of arched ceilings or round windows can make your kitchen feel more like it’s straight out of a subterranean home or an old castle! Rounding out the corners of counters and cupboards will also increase the curved theme and soften the kitchen’s look. Using other round elements in design such as archways, round indoor windows and curving sinks will complete the look. A curved corner is, to start with, aesthetically appealing. It catches ones eye, and encourages it to glide around the room naturally. It’s also got a softer, more refined look that a squared off corner. Of course, form must follow function, in curved kitchens more than anywhere. Curved kitchen units make more sense. In a room where most things from mustard bottles to bowels to serving trays are circular, or curved, it makes more sense space wise to have kitchen units that are the same shape. It’s also easier to wipe down a curved side than a square one. Saving time on cleaning is a big deal in a house with children. Eliminating sharp edges can’t hurt, either. These kitchens look like they belong on the set of I Robot. The curved kitchen unit is spotless white, and completely handleless. The best feature by far, though, is the built in LED lights along the counter, and in the wall units. This gives simple light right where it’s needed most. It also looks terrific. Of course, the first curved kitchen unit to think of should be the stove. A range built into an island is a great space saver that clears up room around the walls for counter space. It’s also got an elite, professional kitchen feel. Especially if paired with a curved hanging pot holder above. Another great piece to look for is a corner shelving unit with curved front. This is a great place to store dishes as they can be easily retrieved, and brighten the room. Redoing a kitchen is an investment of time and money. It’s something that can add not only value to your home, but your everyday life. Make sure you chose a style that’s prepared to grow with your family and your changing needs. The curved kitchen style is prepared to do that. Curved islands and counters also help add to the calming effect and help induce a serene atmosphere. A curved kitchen is a great place to include a U-shaped bar or large, uniquely shaped island in the center. A U-shaped island is incredibly functional. It is an optimal design that provides plenty of readily usable counter space. This island can be outfitted with a stove top, sink, cutting surface and more. You’re limited only by your imagination. Best of all, you have everything right at your fingertips instead of having it all spread out over one long counter space. Another fantastic element for a round-themed space is the curved bar. The curved bar is the perfect design for hosting large amounts of people. This layout is an ideal way to break up sharp corners that increase any feelings of isolation and will help create a warm inviting area. Functional and funky, it’s a great look if you have the space for it and impresses guests of all sorts. For curved seating, try a curving corner booth that wraps around the whole table. It creates a cosy, dining experience, optimal for family meals or nights in with friends. Not only is it extremely enjoyable on its own, but it can add an exciting restaurant feel to the eating environment. 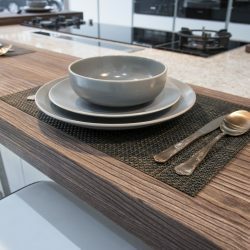 No matter how you design it, adding curved elements or going for a full-fledged round kitchen is a great way to create a relaxing, out of the box kitchen experience. Curve the space, the lines, the shapes, the seats, the walls, or whatever you can possibly think of! It’s a fabulous look that utilises specific design themes to create an incredible kitchen.